Juan Luna’s obra maestra, the SPOLIARIUM , greets you as soon as you step into the Hall of Masters in the National Art Gallery. I have visited it quite a few times, appreciating how this painting brought and still bring so much pride to us Filipinos. 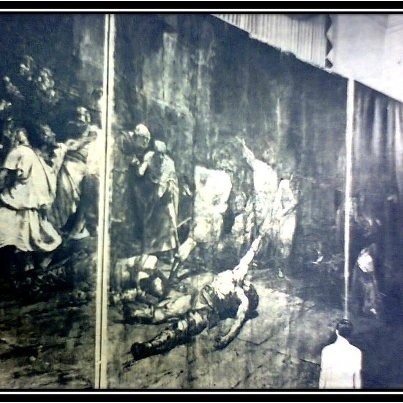 “Spoliarium (1958): Photo shows the Juan Luna masterpiece “Spoliarium” on display at the lobby of the Department of Foreign Affairs building on Padre Faura St. (now the Department of Justice building) where it was mounted on a wooden frame after it was shipped to the Philippines as a gift by the Franco Government in Spain that year. Unfortunately, because of its size, the painting was sliced into three pieces before it was crated and brought to the country. (The slices in the painting can be seen here) The Spoliarium was later restored by artist Antonio Dumlao before it was unveiled again in 1962. The painting remained at the DFA before it was transferred to the National Museum where it can be seen today. 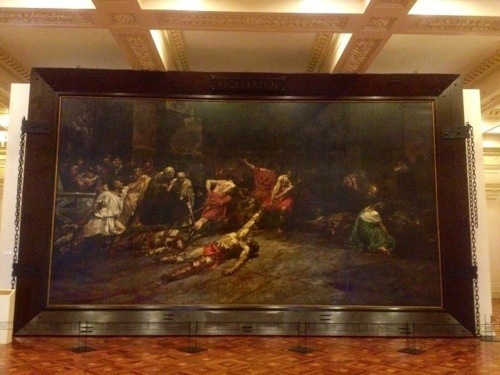 It almost breaks your heart to see even just a photo of a visibly “split up” SPOLIARIUM. Thanks to Antonio Dumlao, we are now privileged to view this obra maestra in all its glory. But pray tell, who is ANTONIO DUMLAO? More Internet surfing and more heartbreaks which can only be appeased by my sharing these with you. First off, Antonio Dumlao was an accomplished artist. He was commissioned to give a “facelift” to the Juan Luna obra maestra in 1960 despite the fact that he was never trained in restoration work. In fact, he never had any formal education in the arts. He quit the same year he enrolled to study fine arts in the University of the Philippines. With or without formal education, Dumlao was a gifted artist. He was a muralist, a portrait canvas artist, a sculptor and a stained glass innovator. For many years, he served as Art Director of San Miguel Corporation and developed a friendship with his top art patron, Don Andres Soriano, through whom he met Don Manuel Elizalde, another art patron. DUMLAO was friends with Fernando Amorsolo, a contemporary, who has great admiration and respect for his work. Ironically, not much is known about DUMLAO. Nor about his deep friendship with his childhood friend from Intramuros days, Vicente Manansala. When Dumlao had a stroke in 1979, his daughter recounted how “Mang Enteng” flew to his father’s bedside. Genuine friends, indeed. 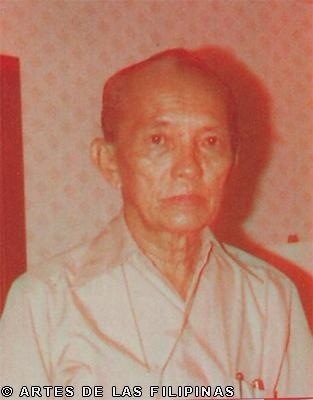 Two years after that visit, Manansala had a heart attack and died before Dumlao, who died in 1983. Ina ng Lahi. Photo sourced from the Net. Not just a painter or muralist. He works on stained glass too! Photo Sourced from the Net. Imagine how this gifted muralist restored Luna’s Spoliarium! Makes me wonder how much of the mural is Luna’s and how much was Dumlao’s. I know, that’s NOT fair to say. Forgive this non-artist, layman’s random thought. One thing’s for sure though. This Luna fan is now officially a Dumlao fan too. 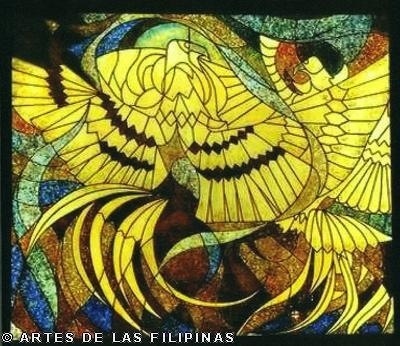 His other stained glass works are still in Malacañang and in the Mosque in Quiapo. Now, this requires a visit! Join me?